Mixed martial arts isn’t “mixed” on gloves: they’re necessary for most competitions and recommended for training and practice fights to protect you and your opponent. We’ve researched and reviewed some of the best-selling MMA gloves around to help you choose the best option! Before jumping into our reviews, take a look at the following list of specs to consider when looking for MMA and grappling gloves. Wrist Straps: Wrist support and protection is vital for good form and avoiding injuries, plus it keeps your gloves in place! Material: Most glove options are made from leather or synthetic leather, combined with foam and other materials. Breathable: Open palms, mesh, and moisture wicking technology are vital for comfort and a competitive edge! Sizes: The sizes offered (one-size or many) can help you get a custom fit, especially if you have very large or small hands. Dimensions: See how bulky the gloves are and get an idea of the fit, but use your palm circumference for the best estimate. Weight: Besides ease of use, weight is important for competitions, which often have regulations on glove weight. Now that you know what to look for, let’s get into the reviews! The top pick and budget pick are the must-reads with our overall favorite options from our research. However, there are eight more products below that cover a wide range of styles and designs for just about any fighting style out there! Let’s dig into the reviews! Our top pick for the best MMA gloves around are the Everlast Pro Style MMA gloves for grappling, mitt work, and competition training. Available in black or red in S/M or L/XL sizing, you can get a good fit that doesn’t require wraps. The gloves come in a zippered mesh pouch that you can use for storage and drying out between training sessions. Everlast’s EverDri technology helps keep your hands dry with a moisture-wicking lining. The pre-curve closed-cell foam padding helps maintain good fist technique and absorb shocks from blows. These grappling gloves feature an open thumb that help you get a good grip on your partner during a training session. However, if you’re looking for gloves to protect and support your thumbs during heavy bag work, you may want to check out one of our more fully padded picks! The Everlast Pro Style gloves are a great option for intermediate to advanced MMA athletes. 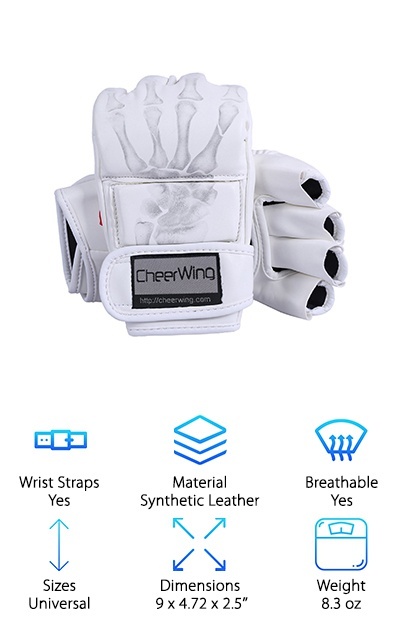 If you’re just starting out in MMA or need a pair of “beater” gloves for rough-and-tumble training sessions, these inexpensive gloves from Cheerwing might be for you! Choose from white, red, blue, or black gloves with different design options for each color. They are made from PU leather and pre-curve foam sponge padding. The open palm design helps keep your hands cool while you train. Note that these gloves have an open thumb without padding, making them good for grappling but lacking supportive padding. If you like to do heavy bag work or boxing, you may prefer gloves with more padding and protection over the thumb area and knuckles. These cheap MMA gloves provide you with the basic padding you need to train safely at home or at the gym. The one-size-fits-most design should work well for most people, and people with smaller hands can use wraps to get a perfect fit. Looking for a pair of real leather MMA gloves? 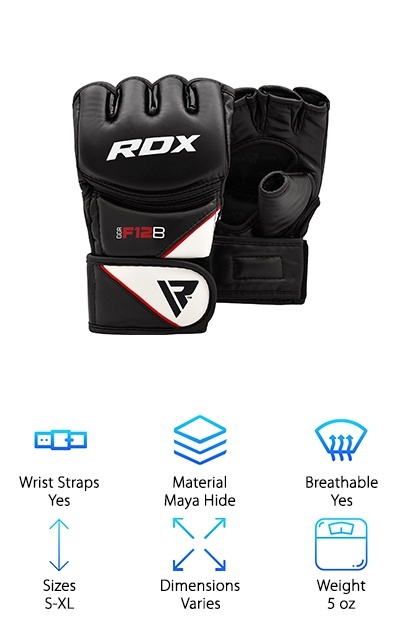 These RDX leather grappling gloves are available in S, M, L, and XL sizes to help you get a perfect fit. Made from full-grain cowhide leather, this type of un-sanded leather retains the grain that gives it superior strength and durability compared to corrected leather. Reinforced stitching holds up to repeated blows and blocks. The curved padding is made from layers of Polymax Tri-Slab PC3 for shock absorption around your knuckles and fingers. Rather than an open-palm design, these gloves feature mesh fabric coverings over the palm and knuckle to wick away sweat so you can keep a better grip. Top it all off with the Quick-EZ velcro closure and you’ve got a snug and supportive fit from knuckles to wrist. The closed-palm design may make these gloves better for bag work rather than grappling, although you can still get a good grip through the mesh fabric. The Combat Sports Pro Style MMA gloves come in youth sizes as well as adult sizes up to XXL, so they’re a great choice if you want to get a perfect fit at any age! You can choose from black, blue, green, electric blue, pink, green, orange, yellow, or red color designs, too. If you want to compete in professional rings, these gloves meet all state regulations and requirements, including the five-ounce weight limit. Synthetic leather over full ¾’’ padding provides a tough barrier for shock absorption and safety. The open palm provides breathability and allows for grappling for Muay Thai competitions as well. The variety of sizes and colors available make these a great choice for anyone looking to enter the ring, whether they’re a kid or a grown-up. Choose one of the unique color options to make sure you never lose track of your gloves while at the gym or attending a competition! The Venum Challenger 2.0 gloves deserve a spot with your MMA fight gear. Choose from all-black, white on black, orange on black, or green on black color options and S, M, or L/XL sizes. Venum sponsors some of the top athletes in MMA, Muay Thai, and related sports while also designing MMA and UFC gloves and other gear. These highly padded gloves use thick layers of foam and reinforced finger and thumb openings for shock absorption. Velcro straps in a double-closure design provide the exact fit you need around your wrist and easy access. The supportive shape design of the Challenger 2.0 gloves make them a great investment for handling showdowns in the ring with pride. You can form a comfortable fist without fighting the gloves thanks to the careful padding locations and stitching. 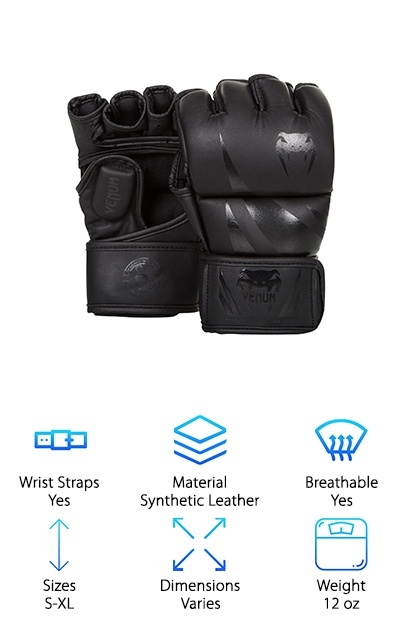 Venum is a great source for MMA gloves and gear! When you’re striking and training, protecting your knuckles and thumbs becomes more important than ever. The Everlast Train Advanced MMA gloves feature a thick boxing-glove style curved padding over the open half-glove design to shield your knuckles from impact. Available in S/M or L/XL, an open palm provides breathability while reinforced finger loops hold up to long sparring sessions. Padding over the thumb provides additional protection without affecting your mobility. All of the padding is made from closed-cell Durafoam. The hook-and-loop wrist strap with tri-sect closure provides a secure fit that won’t come loose during training or practice. Plus, the EverFresh antimicrobial lining keeps your gloves from smelling like old sweat! These heavy-duty gloves are designed for training and can also protect your hands during extended sparring sessions. 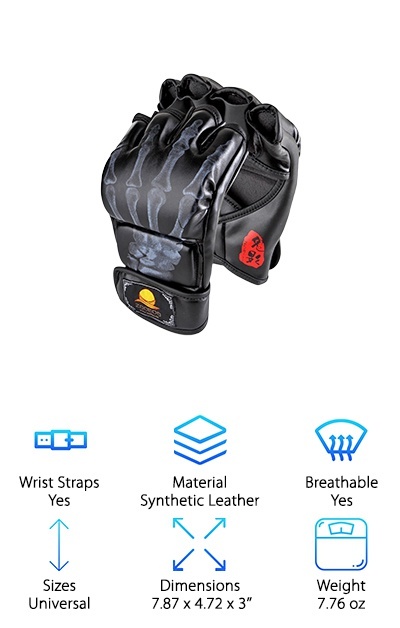 If you want to hone in on the punching bag to perfect your technique, these gloves have got you covered! 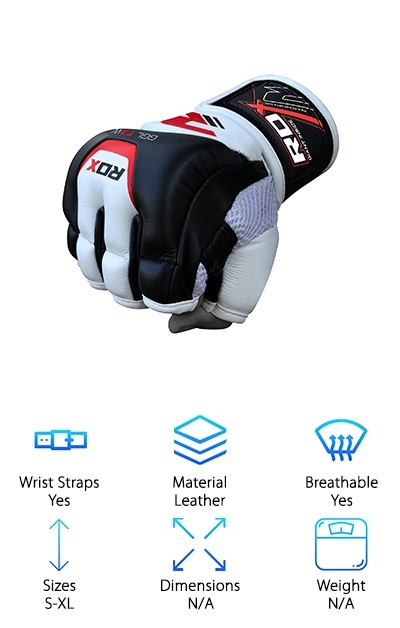 Choose from black, blue, pink, or red color options in four different sizes to get a totally customized pair of MMA gloves from RDX! 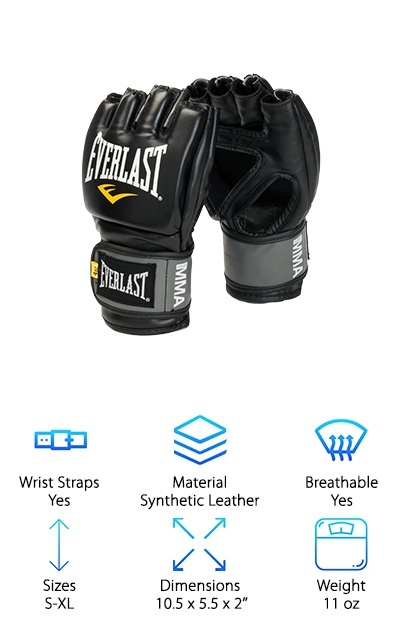 Made from ultra-durable synthetic Maya Hide leather, these gloves are made to hold up to tons of abuse during intense mixed martial arts sessions. The interior padding is made from polymax contoured Tri-Slab PC3 spongy foam in a curved shape to protect your knuckles and encourage good punching form. A thumb sheath supports and protects your thumb, too. Thick velcro closure ensures a snug, supportive fit around your wrists. Breathability was considered as well as durability with the D-cut palm-side design, plus moisture-wicking fabric to wick sweat away from your skin. Although no glove can stop the flow of sweat entirely, these RDX MMA gloves can at least make it more comfortable! We liked the size options and durable-but-breathable design of these gloves--they’d be a great addition to your fight gear! The Granvela ZOOBOO Gloves come in skeletal hand or bloody claw print designs in blue, black, white, red, or yellow. These are the type of MMA gloves you want for intense training: they’ve got some serious foam buffers! Inside of the synthetic PU leather outer, high-rebound EV foam, buffer sponge, and high-foaming PE protect your hands from hard hits. Cutouts in the palms encourage breathability. A pre-curve design with thumb support encourage good form. A padded velcro wrist band provides a good, adjustable fit with sturdy wrist support. This tough, highly padded glove is ideal for people who practice MMA regularly and intensely! People with smaller hands may find these one-size-fits-most gloves are too large, but wrapping can help improve the fit. For lighter training or more casual fighters, they may be overkill. The fun design options provide a cool custom feel to your equipment, too. 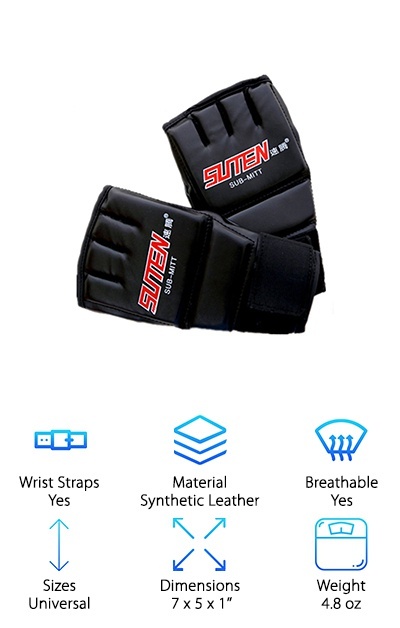 Available in black with a red or gold label, the SUTEN MMA Muay Thai gloves use a half-glove design for awesome breathability. Under the shiny faux leather outer, closed-cell Durafoam padding protects the backs of your hands, your thumbs, and your knuckles. The thick wrist straps and tri-sect closure provide support for your wrists while you train. Padding on the thumb protects it during closed-fist moves, and the contoured fit is designed to make forming a fist easy and natural. These gloves are one-size, so they may not fit children or women with small hands well, and may be too small for men with super-big hands! However, you can wrap your hands to tighten the fit. 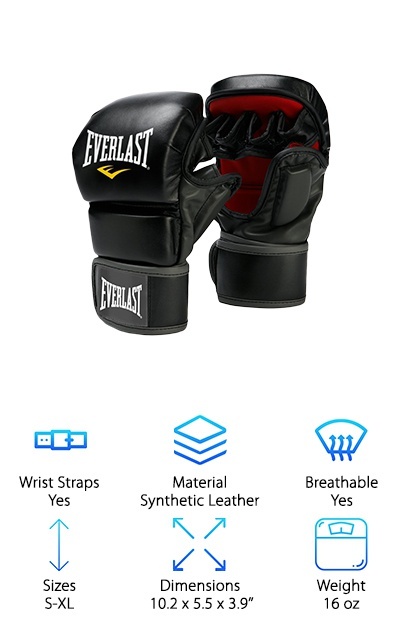 These gloves can be used for training, refining your punching technique, and they can also be worn inside of boxing gloves. For intense sparring sessions, you may prefer gloves with more padding and structure. 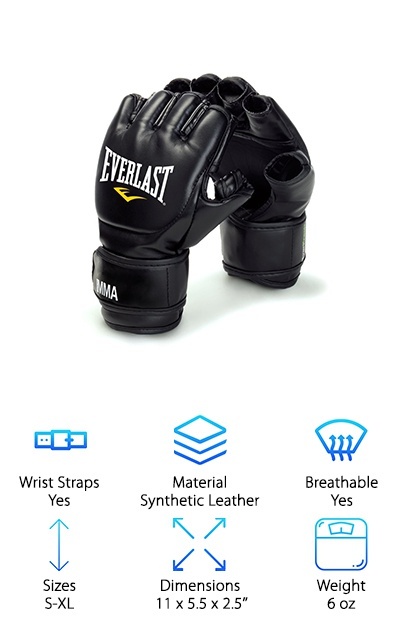 These MMA grappling gloves from Everlast are designed for grappling, competition training, and mitt work. The gloves come in S/M or L/XL sizing options. Women and others with smaller hands will generally prefer the smaller size for a better fit. 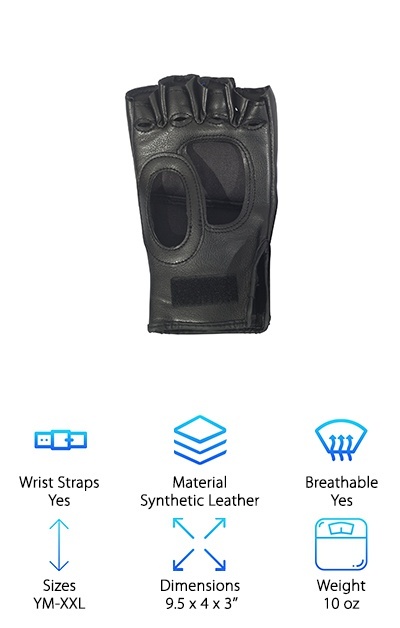 The grappling gloves are made from synthetic leather with almost an inch of padding over the knuckles, plus reinforced seams and finger slots. The elastic cuff helps the gloves fit closely to your hands, and the hook-and-loop full wrist wrap strap provides support and security. Thanks to the EverFresh antimicrobial treatment, you can avoid odors and “glove stank” due to sweat buildup. Some people use them with punching bags, but they leave most of your fingers exposed for getting a better grip while grappling. The gloves come in a soft zippered mesh bag that’s a great everyday carry bag to let the gloves dry out between uses.